Languedoc Roussillon benefits from hundreds of miles of quiet roads and off road routes. It's a great place for a cycling holiday in the South of France. Please see the links on the left for more information about self-catering holidays in Aude, Languedoc Roussillon, South France. 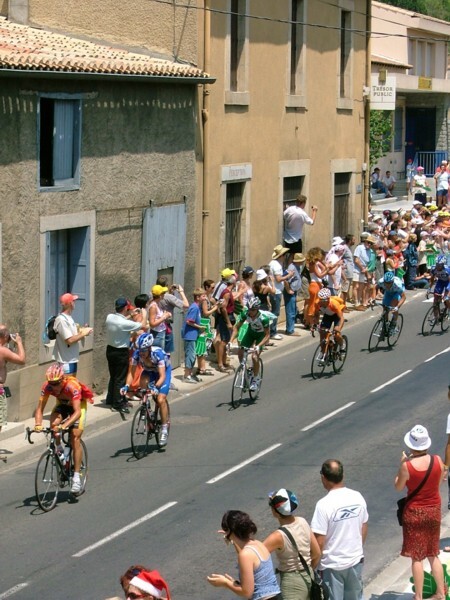 If you're into cycling as a professional, or perhaps as a spectator sport, you may be aware that the Tour de France goes through Languedoc Roussillon and occasionally through Couiza, giving guests at Gite des Cathares a ring-side view of these top cyclists. French drivers tend to take great care when over-taking cyclists and cycling is a very popular past-time in this area. As the gite is large, you are welcome to store your bicycles inside. If you're looking to hire bikes locally you can try any of the following bicycle hire places in Aude (ask for "location de velo" or "location de cycle"). Languedoc Roussillon benefits from hundreds of miles of quiet roads and off road routes. It is a great place for a cycling holiday in the South of France. Please see the links on the left for more information about self-catering holidays in Aude, Languedoc Roussillon, South France. Cycle hire shop for cycling vacations in Limoux.